Last week was London Toy Fair and with Tomy in attendance there was a lot of speculation as to if they would have the Sonic Boom toys, as well as ‘what toys would they bring?’ London Toy Fair is the place for toy makers to show off their products to retailers and perspective buyers for 2015. So with the toyline out in America, would Tomy bring the whole line over? Or just the best sellers? With many merch collectors in the UK waiting to see, this is quite important news… well… they brought the lot over, including some new lines. It looks like Tomy are willing to sell the entire line to potential retailers, this is very good news for collectors and fans of merchandise here in the UK. However if the whole line will make it to retailers remains to be seen. However more interesting are the new toys we’ve spotted including one very cool addition, what appears to be wearable power shoes! Now this is obviously just a concept image, but the fact it’s on show suggests it is in development, don’t forget, Jazwares also had temporary boxes on display for their toys at these events, many of which did see a release. Of the new toys on show, we spotted the following. Sonic Saves the Day pack – includes crystals and 3 figures (sonic, Tails & Eggman). Sonic with a hover board. A new mini plush with a grip. Tails & Sticks wearing commando/camo paint. There might also be a new Knuckles figure as well as a new sized figure but I’m unsure on that one. No release dates yet for the toys either in America or the UK, but it looks like the toys are on their way to EU shores. 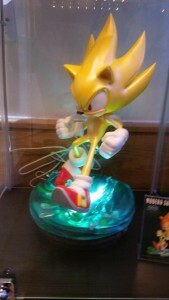 At Saturdays Weston Super Sonic convention, First 4 Figures dropped one heck of a surprise. Sitting in the corner of the room was a display case with a black sheet covering a mystery object. When the announcement came a wave of ‘Oh god, I want one’ seemed to echo around the room. Joining their Modern Sonic the Hedgehog range is Super Sonic, and oh boy this is a very impressive piece. The scene depicts the climax from Sonic Adventure in which Super Sonic faces off against perfect Chaos. The base is a flooded station square, around the base are details of water pipes and underneath the flood waters you can just make out details of the road. Super Sonic himself appears to be flying into the scene. This version was the exclusive variant which includes some lighting features and these are very impressive. The lighting seems to follow Sonic further giving the impression of movement. However it has an added effect. 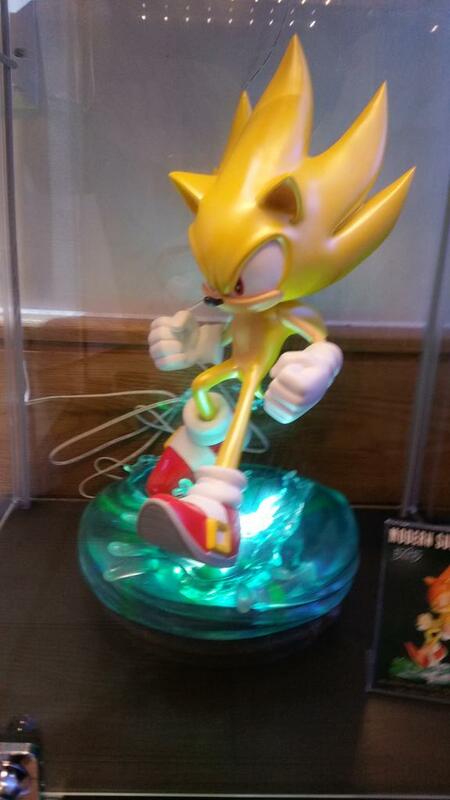 The lighting shines through the water which emits a green/blue water effect onto Super Sonic’s entire body. The effect looks amazingly cool when viewed in a darkened environment. The statue is currently in the prototype stage so parts of it will change. The rep told me that one confirmed change will be his spikes, but these are minor details to make them appear individual as opposed to being congealed. No price details were given, however pre-orders will open some time in 2015. We’ll let you know when more details are revealed. Jazwares: End of the Road for The Sonic Line? After what seems to have been a long time coming, TSS has learned of another strong reason to suggest that Jazwares has ceased producing items for the Sonic the Hedgehog series. In a recent Email between merch-seller Ogilvie on the SSMB, his distributor of Jazwares merchandise has said that the company will no longer be carrying Sonic the Hedgehog Merchandise. Following the news that the Sonic the Hedgehog section of Jazwares’ website seemed to have vanished not long ago, it’s yet another strong reason to believe that the once very active line of toys has come to an end. Jazwares has been producing Sonic merchandise (primarily articulated action figures) from as early as 2009 when they produced their 10 inch now-sought-after Metal Sonic figure, so after a near 5 year run, it finally looks to be over. Were you a fan of the Jazwares Sonic the Hedgehog figures? Got any favourites? Let us know! Props to Ogilvie on SSMB for this information. This information is a little old, but it’s only just come to light as far as I’m aware and sheds some light onto Sega’s strategy for Boom in 2015. At the Brand Licensing Europe event held in October of last year, Sega revealed some details regarding Sonic Boom and gave some details on products which will soon be revealed and even tentative release dates for their products. Cartorama will produce back to school products including backpacks and gym bags (coming July 2015 in Italy). As well as Sonic, a bunch of non Sonic products were also revealed. Retro adult apparel & Accessories. Football Manager on-line store (selling physical goods). If we get hold of any images or details of these products, we’ll let you know. Jazwares Removes All Trace of Sonic Toys From Its Website… Sorta. So about a year ago, I made a lengthy article about how it seemed like Jazwares had cancelled it’s entire 2014 Sonic toyline, I was forced to retract that a few months later when about a month later they actually released a Metal Sonic plush, and life was good. However, it seems I might have been about 10 months early with my original article. If you go to the Jazwares website, you’ll notice that Sonic is no longer listed. In fact he’s not listed at all on the main page in any categories. However, the Sonic section is still on their site if you visit the page directly, but trying to get there via the main page is no longer possible. Should also point out, that other franchises which have been cancelled such as Mortal Kombat are also no longer displayed. So, party over? Or oversight? Thanks to SSMB member PatMac for the heads up. It seems funny to think why this has taken so long to make, Sonic is over 20 years old, yet I could name franchises not even half that age which have more printed publications like this. Why it took Sonic 20 years to catch on is anyone’s guess. But, we finally have it! An official history of Sonic the Hedgehog, published by Pix’n Love, fully authorized by Sega. Time to take a break from being jealous of Japanese Sonic fans! Remember those special 10th Anniversary products that SEGA released to mark the launch of Sonic Adventure 2 last year? Well, it looks like some of them have made their way across the Pacific and are available to purchase in North America. Click here to grab the Sonic Ring and click here for the Sonic Figurine, which you can buy on Amazon. Thanks for the heads up, Swirlvision! Just a quick Public Service Announcement on this – following our initial news on Tokyopop producing a US release of the Sonic Adventure 2 soundtrack, it appears that the CD is already available to buy (it was originally reported to come out in February). 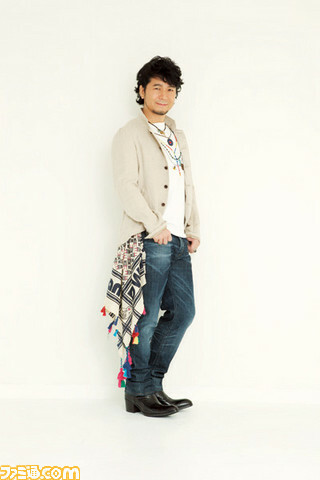 The Sonic Adventure 2 Official Soundtrack features 26 tracks on one CD, handpicked by lead musician Jun Senoue and including exclusive US-release remixes. You can pick it up for $14.98 via Tokyopop’s website here. 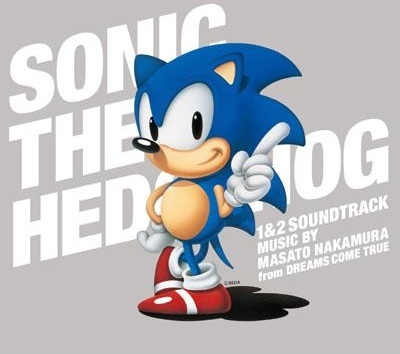 You can now buy the Sonic Adventure 2 soundtracks – the Vocal Album that we’ve covered before, and the Original Soundtrack called Multi-Dimensional – online. You can get the Vocal Album, titled Cuts Unleashed, for around $24 and it comes with 16 tracks. The Original Soundtrack includes main themes, action stage music and more in a DOUBLE-CD package and will set you back about $30. Both can be purchased from either CD Japan (Japanese site) or Tokyopop. Wave Master has launched a special website dedicated to the music of Sonic Adventure 2, most likely timed to promote the upcoming Japanese release of the Vocal Soundtrack. The English side of the site has yet to open, but there is a wealth of goodies hidden within the Japanese side, including lyric sheets, information and track listings. Go check it out right here. Bad news for merch hunters everywhere! I just found out that figure company Resaurus is going out of business. That means no ‘Sonic Series 3’ toys will be released. Resaurus is having a 50% off sale to get rid of their outstanding stock, grab what you can now by going to the Shop Resaurus website and Resaurus.Com. Sega of Japan is unleashing these new credit cards in Japan, and boy are you going to be jealous. Customers can choose either a Visa or MasterCard, with the Visa obviously looking much cooler. I mean, imagine whipping that puppy out to pay for your goods. The card will get customers 10% back at participating restaurants, snag free tickets to Sega’s Joypolis and more. As we expected, the Vocal Collection won’t be the only Sonic Adventure 2 CD soundtrack that will be released. A 2-disc Original Soundtrack package will be released on September 5th, covering all the instrumental music in the game. It’s expected that there will be at least 60 tracks total in the pack. More news as we get it.